Sending email has long been easy to do with the .NET Framework. There really hasn’t been a facility for checking email though. I recently had a need to be able to check email with and send a response with Bombali (a monitoring tool). I went searching for examples or a solution I could use. I found a few articles on this from a few years ago including the .NET POP3 MIME Client. I never found anything that was free and I never found anything that was easy to configure. Those who know me know I have a tinge of the NIH (not invented here), especially when there are no free alternatives. So I created my own based on the articles I had read. And in the spirit of chucknorris, I named it SidePOP! You see there are two items here. The first one has the required items in it. The second one is the entire set of items to configure. Notice that we are asking for a password in plaintext. This is where you might think about encrypting this section somehow. Configuring SidePOP to run is a little more verbose that I might like right now. Looking below you see that it’s still not that much code. I hope to set up a facility to automatically look at the configuration file and configure SidePOP (for those that like XML). If someone wants to send me a patch as well, that would be awesome. When I start the service, I call the method configure_mail_watcher(). Because I can have multiple accounts I can check with SidePOP, I am going to loop through the settings and check each one to ensure they are enabled. If so, then I am going to set up a SidePopRunner and subscribe to runner_messages_received (this may not work with multiple accounts, I haven’t yet tested that). Then I kick off the runner for that account. I could instead subscribe to runner.MessageReceived (instead of runner.MessagesReceived) for getting an event notification for every message instead of batching it up to a list if I desired. When a message is received, I find out how long the service has been up. I didn’t show it here, but up_time is a System.Diagnostics.Stopwatch. In the constructor I start it. Now I just capture how long it has been up. Then for each message, I send a response to the sender of the email address telling them how long the service has been up. To add more sophistication, I could very easily add a rules engine here to process the message based on a list of rules looking for keywords in the email. That’s all I need to do. Now I’m up and ready to rock. Here is what it looks like running with Bombali. I send the service a text message. This is what it logs. 2009-12-07 23:59:05,875 5 [INFO ] - Bombali received a message from someone @ somewhere.net. Responding that service is still running. 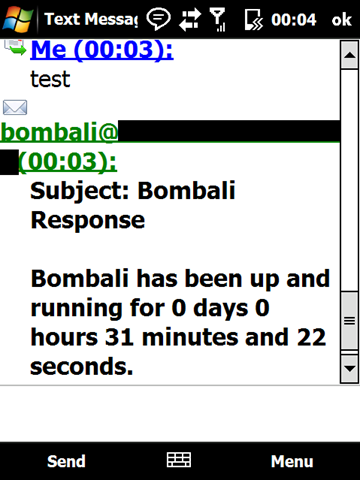 Bombali has been up and running for 0 days 0 hours 31 minutes and 22 seconds. This is what I get from my phone. Now I know that my service is still up and running with a simple text. All for the low price of a few lines of code and the sidePOP.dll library. SidePOP gives me a level of sophistication that I didn’t have before. Now that I have access to get email, I could very easily add rules to do different things based on the content of the email received. How often have you wanted your application to check email and just didn’t want to pay the price for the products out there that can do this? Now it’s completely free with SidePOP. WARNING: SidePOP will delete your email when it checks it. That’s how it can be sure it’s only dealing with new messages every time. Do not test on an account you care about. You’ve been warned. Awesome library man! This is exactly what I was looking for. Thanks, and keep up the good work. This is exactly what I've been wanting for the next version of @MentionNotifier! @Ira: Glad to hear it! Let me know if you find any problems with it so I can get them resolved quickly.